I don’t know if anyone has noticed this but the packaging on Lather Bros just keeps getting better with each new release. The Flora Colossus is a great example of this. I love the graphics. You absolutely know what this is all about the minute you lay eyes on it. A limited run tribute to one of the most beloved Marvel characters. Sold as a set shaving soap and balm. 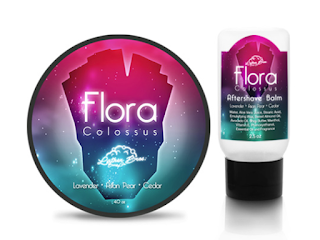 Flora comes in a slightly translucent 4oz white plastic tub with a screw-on black lid. On the lid the label with the product name, logo and scent profile. Also for those who stack shaving soap, we have a side label with the name of the product, address, website location, logo, and ingredients. 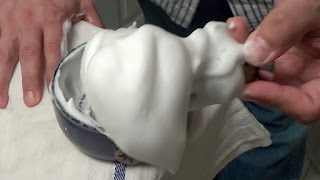 Lathering was no problem and I was able to whip up a bowl of this amazing rich creamy lather in a little over a min and during that time the scent increased as well. I had great coverage allowing me to “Paint my Face” so to speak and it really got into my beard. The slickness and glide are tops on Flora allowing my razor to go over trouble spots without irritation. The Aftershave balm of this set is absolutely the star of the show for me. I’m not sure what in this that sets it apart from all the others but it sure was a pleasure to use. Not like balm’s I’ve used in the past this one was much thicker and just the right touch of menthol to create the perfect ending to a shave. Truly an outstanding product and should be added to the entire line and as a standalone menthol version as well. So, I had a terrific shave with Flora Colossus and if we’re lucky enough to get a set before they sold out I’m sure you're having a terrific shave with them too. For the rest of you who missed out on this limited edition, we can only hope that Andres finds the time to make more.